Always worth popping by your desk Mary Anne – I love it! Plenty of good storage ideas this week and now photgraphy tips too. Does the lens thing work on digital SLRs as well as regular? I love all your little storage boxes. Getting slowly to a few more desks this evening even though its now Thursday. OMG your room is well sorted…can you come and sort mine now LOL…what a cool thing with the lense. Hi MA wow super duper organised this week love all the little drawers they are so useful. 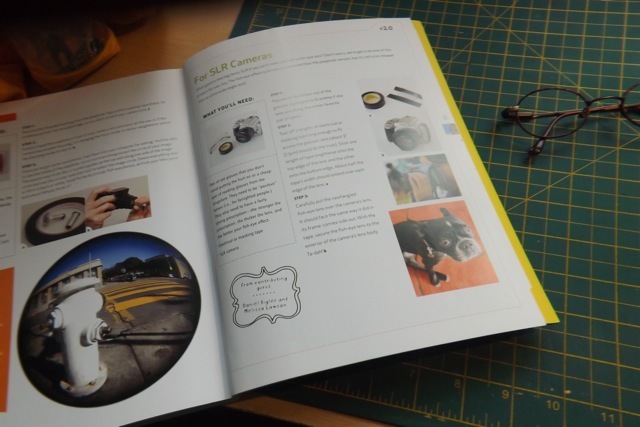 the fish eye is so cool i’m off to poundland again ….. I too love to reorganize, trouble is I always forget where I’ve reorganized my stuff to lol. Glad your shelf fitted, don’t you just love it when a plan works. 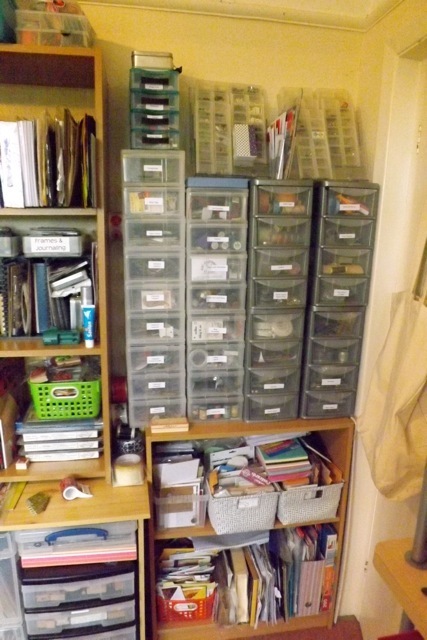 I love to reorganize…love the fact that that set of shelves fitted…tight squeeze! When I read your comment on my blog I had to laugh. You need to finish that purse!!! tee hee. Imagine that we used the same color scheme! That photo is amazing. I’ll be rushing out to buy the strongest pair of cheap readers I can find. I swear the washi tape was moving!!!! I have so much trouble with WordPress, trying again to comment. Sorry if I don’t. Look forward to hearing about the fish eye when you try it again. Sounds mega interesting. Great storage – lovely and tidy. Gosh, you have been busy, it all looks super organised now. Wow, there’s organisation for you, it must be that kind of week as we’re trying to do the same right now and wishing we’d never started! I love that concave lens shot..so much clarity in the middle, fuzzing out….pretty much how I see the world!! 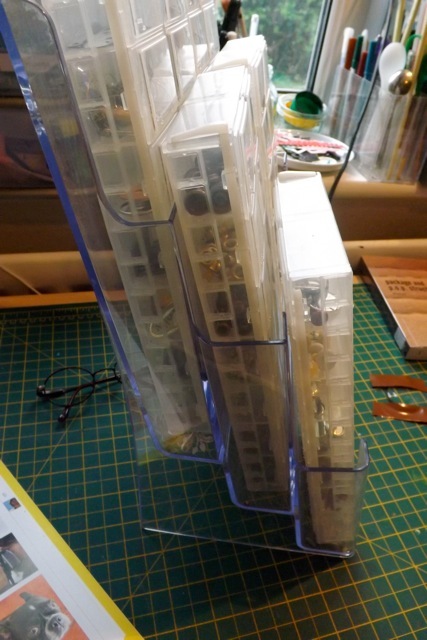 Great re-purposing of the magazine holders, brilliant spark of an idea. I’d like a couple months off to go through and properly get a grip of my room. Hmmm, may be too late for that ater all this time of not really working!! Thanks for sharing your idea with the brochure holders. 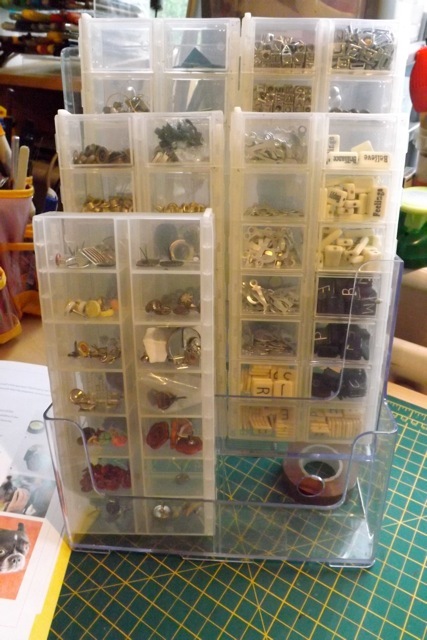 I already have my embellishments sorted like you in those containers but have them stacked in a drawer. I like the way they’re easy to see and find in the brochure holders. I might have to pick some up next time I’m at the stationery store. Cool effect with the lens. I look forward to seeing more of your tests in the future. Ha!! Well, that’s a clever effect you achieved with an old lens! 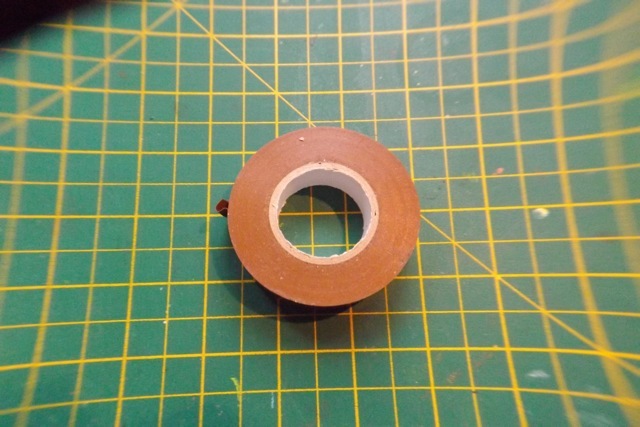 You do feature some interesting (and oddball…) things on your desk. We never know what you’re going to do next…and that’s the fun part about it! Wow you so many stuff you can open your own craft store if you wanted! lol But hooray for tidy spaces! 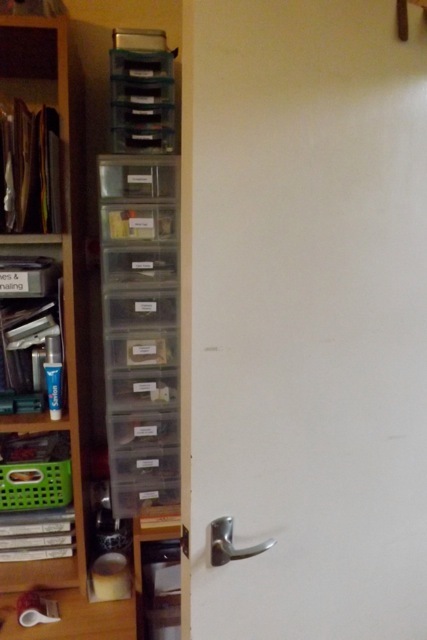 A great TIDY space today! Mm just tad jealous… and wow know we know how fish see after all…maybe 😀 love all your organisation ideas, am going to re-do mine one day too.. one step at a a time.. So tidy..heavenly !I dream of this tidy! What a clever way to store your little bits and bobs. I’m super impressed. And I like the idea of the fish eye, too. Maybe my eye glasses would work (grin). Actually, I’m near sighted and, if I recall correctly, you need just the opposite for the fish eye to work. Wow you have a lot of stuff!! But wonderful stuff and I am jealous lol! Happy WOYWW. That is a lot of storage but well organised. that is a funny concave look, how did you get that picture? LOL! Without a 2nd camera it would be impossible to SHOW you 🙂 Basically you need the strongest lens you can get for FARSIGHTED vision and you just tape it over the lens of the camera (for an SLR) then take the photo thru it. Or you can use a peephole (like for security on your door) for point and shoot cameras.